Some Qt/KDE development should be found here! Dianara v1.3.1 is upon us! Time for another minor release of Dianara! Well, not so minor after all! Option to browse posts from a user. Option to set or change the e-mail address associated with your account. 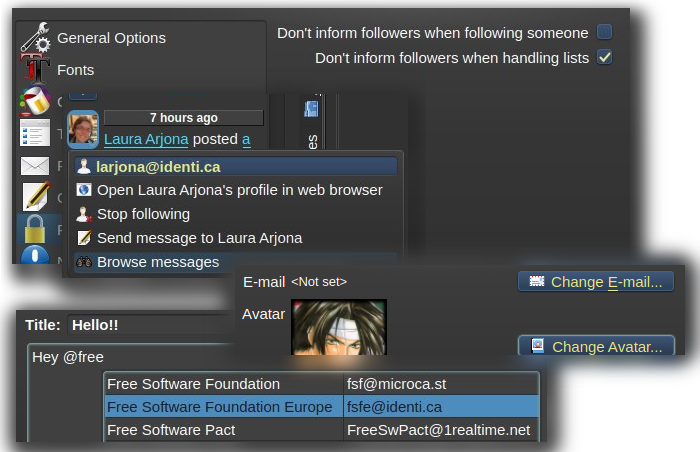 Added a Privacy category in the settings, with a couple of new options related to following people and managing lists. Nick autocompleter now shows user ID, too. Proper links are made from URL’s found anywhere, when pasting plain text. The “browse messages” option will appear in the drop-down menu that’s available in any avatar, that is, in the Meanwhile activities, in all the posts and in all the comments. There’s, sadly, a big catch: due to limitations in the information provided by the Pump API, you can only use this option with people in your same server. If you’re jessie@microca.st, you can only browse posts by people @microca.st, etc. The feature loses a lot of usefulness at the moment due to this limitation, but still, it can be very useful when available. The option to change the e-mail address of the account will allow users of the identi.ca server to change their e-mail address, unchangeable since the migration from StatusNet, and users of other servers, to set an e-mail address for the first time. Depending on the server, this could bring e-mail notifications for activities, and allow for password recovery. The new Privacy category in the settings (if you’ve never visited this dialog, you really should) has two options, to avoid sending follow/unfollow activities to your followers, and to avoid sending add/remove (from list) activities. This basically means that if you enable these options, only the person being followed, unfollowed, added, or removed will know about it, and nobody else. Keep in mind, however, that letting your followers receive this information helps the network grow! Not much to tell about the fourth item… since v1.3.0, when typing @ you get a list of users to mention. Now, if you have, say, 3 contacts named “Albert” (and nothing else), you can know who’s who by their ID’s. As a bonus, the new popup is better positioned and sized! As for the last one, up until now, if you pasted a url-looking text, like http://something, a proper HTML link was created, and all was fine. But if you pasted, say, from a text file, something like “check out this cool link: http://pump.io “, nothing special happened and the link was not really a link, and not clickable. Now, something like the latter case will work, as long as what you’re pasting is plain text. Check the CHANGELOG for a more detailed list of changes. Dianara 1.3.1 is available in English, Catalan, Spanish, Italian and German languages. There’s a partial Polish translation included. You can find Fedora packages at HowCanUHaveMyUsername’s repo. 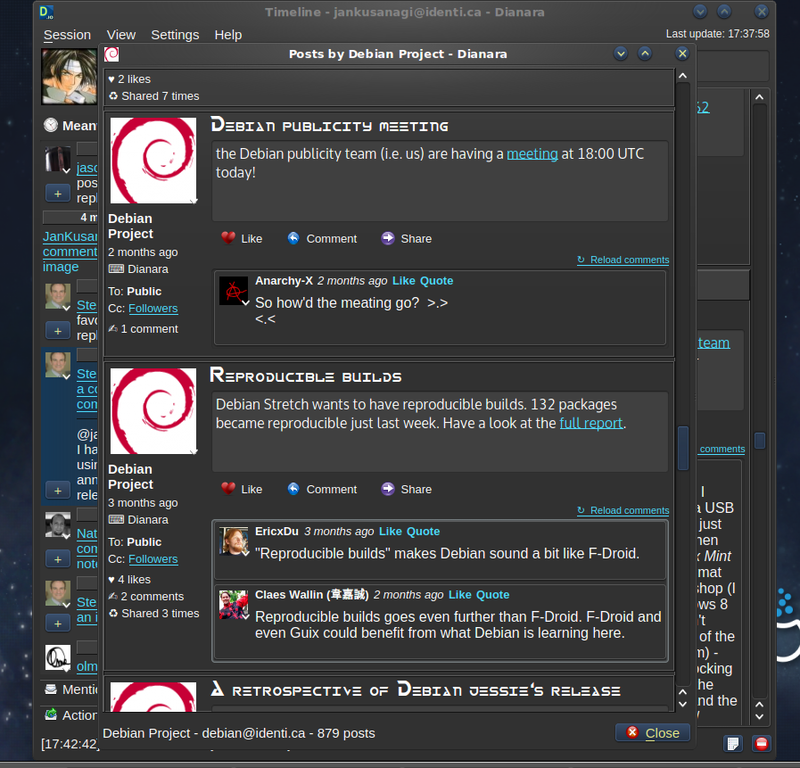 For Archlinux, you can find Dianara on the AUR, (also the -dev version), and for Gentoo, you can use the ebuild. As for other platforms, LuisGF, a fellow pumper, provides builds of Dianara for MSwindows and is working on builds for OSX. If you need or want to build from source, check the INSTALL file for details on how to build it and the necessary build-time and runtime dependencies. Also, a reminder: the development version is now hosted at gitlab.com. This entry was posted on Sunday, August 2nd, 2015 at 4:58 PM and is filed under Dianara, Projects, Pump.io, Qt. You can follow any responses to this entry through the RSS 2.0 feed. You can leave a response, or trackback from your own site. One Response to Dianara v1.3.1 is upon us! Mageia Blog (English) : Mageia 7 beta 2 is out!